One of the great things about Mass Effect is that the player is given a large amount of control over character personality and even history, to some degree. Character creation in the first game consisted of reconstructing Shepard’s history. Players were able to choose a place of birth and a military service distinction, as well as a character class and custom appearance. Shepard’s Pre-Service History gives the character a unique set of in-game conversations as well as providing a bonus to starting paragon and renegade scores. The three options are: Spacer, Colonist, and Earth-born. The Spacer option gives a large bonus to the starting paragon score and is the only option that allows Shepard to speak with a parent. Shepard’s parents were both in the Alliance military and the family spent a large part time on Alliance cruisers. A serviceman that knew Shepard’s mother appears on the Citadel and that quest gives Shepard the opportunity to call mom. Colonist gives a small bonus to both paragon and renegade. As the child of colonists, Shepard was born and raised on Mindoir only to suffer a brutal raid by batarians at the age of sixteen. Another survivor of the raid makes an appearance on the Citadel in the first game. An Earth-born Shepard grew up in a rough neighborhood and ran with gangs, only joining the Alliance to escape that life. There is a quest on the Citadel to help a fellow gang member. The military service distinction, known as the psychological profile, adds more color to Shepard’s history. There are three options here, as well: Sole Survivor, War Hero, and Ruthless. The neutral option, giving neither paragon nor renegade points, is Sole Survivor. Shepard’s squad was killed by a thresher maw attack on Akuze but one of them surfaces years later and is killing scientists. War Hero is the paragon option. It gives Shepard a history of foolhardy self-sacrifice after single-handedly repelling a batarian attack on Elysium. Lastly, the Ruthless profile gives Shepard a history of leading a squad into horrible odds and taking heavy casualties. It also mentions that Shepard killed surrendering batarians rather than take prisoners. Soldier: A master of armed combat, tough and hard to kill. Soldiers wear the heaviest armor and are the only class to receive advanced training with the assault rifle. Engineer: A tech specialist able to access and bypass electronic security measures with ease as well as shut down enemy weapons and shields with advanced tech grenades. Adept: A powerful biotic able to shape dark matter in a variety of ways. The adept is particularly useful when control of the battlefield is necessary, able to create singularities and forcibly move enemies around. Infiltrator: Almost an assassin, the infiltrator specializes as a sniper and has a unique cloaking field in addition to respectable technical abilities. Sentinel: This class employs a mix of biotic and tech abilities to control the battlefield. In later games, the sentinel has specialized tech armor that affords greater protection and has a powerful counter attack. Vanguard: A high-risk, high-reward class, the vanguard supplements powerful biotic attacks with advanced shotgun training. It is the only class to receive the Charge power in Mass Effect 2 and 3. For my Shepard, I chose a Colonist War Hero Infiltrator. This clearly established a long, antagonistic history with batarians. It also allowed me to use the sniper rifle as my primary weapon. I grew up in a rural hunting community. Staring down a scope just comes naturally to me. For romance options, I romanced Liara in Mass Effect, no one in Mass Effect 2 (despite trying to reconnect with Liara in Lair of the Shadow Broker), and finally got to admit mutual love with Liara in Mass Effect 3. It was a very satisfying arc for me to play through. On my main play through of the game I went mostly paragon. There are a few notable instances where I strayed from that, though. I found myself really disliking a number of the named batarian characters. In the Bring Down the Sky DLC, I killed the terrorists rather than let them go. I simply didn’t trust them to not try again and I considered the lives of a few innocent engineers to be the price I had to pay to stop them once and for all. There were a few more run-ins with similar results. I saved the rachni queen (twice), saved the genophage research, successfully and truthfully spread the genophage cure, brokered peace between the quarians and the geth, and any number of other interesting things throughout the games. That is to say, I played Mass Effect and went mostly paragon except for having a sore point when dealing with batarians. 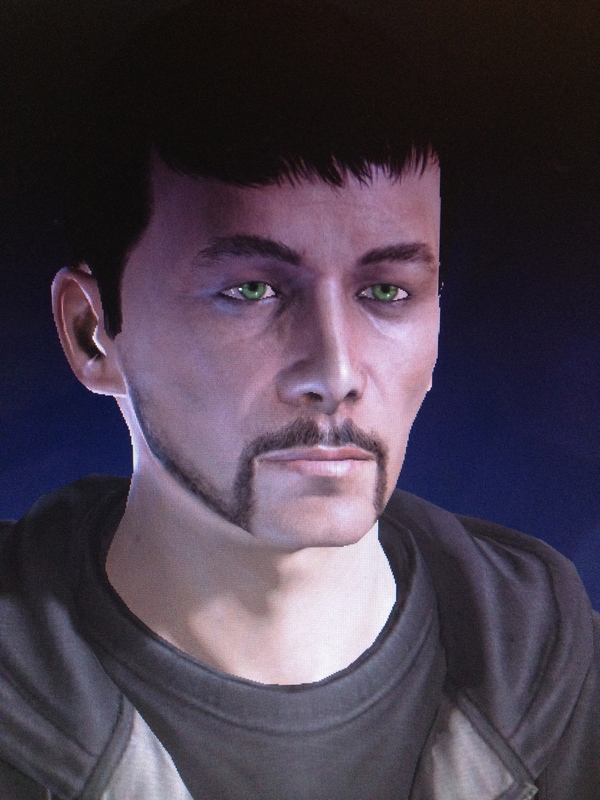 Here I present to you Myth Shepard, my character as he more or less appeared upon his arrival at the Citadel. SFX. Snap Shot: Spend 1 PP to reroll when using Sniper Rifle. Limit. Gear: Shut down SNIPER RIFLE and gain 1 PP. Take an action against the Doom Pool to recover. SFX. Cloaked Sniper: Add a D8 and step up your effect die by +1 when using INFILTRATOR ARMOR to create camouflage or invisibility assets. Limit. Shattered Cloak: Shut down Tactical Cloak after an attack action and gain a PP. Spend a PP on a reaction to recover. 1xp when you warn people of the reapers and they ignore you. 3xp when you understand the warning from the prothean beacon. 10xp when you convince Saren the reapers are a threat or have to kill him to save the galaxy. 1xp when you go into battle with your squad at your side. 3xp when you increase a relationship die by +1 step. 10xp when you change your outlooks to a D12 and D4. You may note that I chose Tactical Cloak as a power when it doesn’t appear in the first game. Given how limited and generic the skill system was in Mass Effect, I found that looking to the later games for inspiration on mechanics was the way to go in a number of cases. The later games were definitely more polished in the combat. This entry was posted in Characters, Mass Effect, Role Playing. Bookmark the permalink.